FlutterbyBooks: The Five People You Meet In Heaven by Mitch Albom. This book has been on my 'to'read' list for ever. The concept of the story just sounded so interesting and I wasn't disappointed. The book takes us on Eddie's journey from death through heaven. Each person must make a journey touching five people who have influenced their lives, in order to realise the impact they had upon the life they lived. I enjoyed the philosophical side of this book, but it doesn't push any heavy beliefs onto the reader. 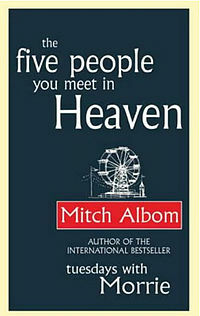 Instead it simply tells the interesting story of Eddie's life through the people he meets in Heaven. It's a heartwarming story which is very enjoyable to read. And what's more there are only just over 200 pages in this book so it won't take you long to read.